"41MR12, Burial III, 46" by Timothy K. Perttula and Robert Z. Selden Jr. VESSEL FORM: Double or compound vessel, upper part is a carinated bowl and the lower part is a bottle body form. There are two suspension holes on the rim of the carinated bowl part of the vessel. DECORATION: The carinated bowl portion of the vessel has discontinuous hatched scrolls repeated three times (characteristic of var. 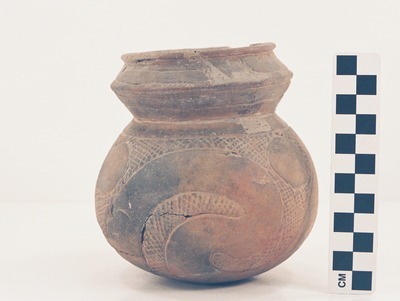 Darco of the Simms Engraved type), as well as two horizontal engraved lines on the body part of the carinated bowl section while the bottle portion of the vessel (the Hodges Engraved decoration) has cross-hatched zones with negative ovals and curvilinear scrolls. Compound engraved vessel with Simms Engraved and Hodges Engraved motifs, MR12-46.